If you're not a Windows Insider, it has been a little while since your copy of Windows 10 received a major update -- but that is about to change. 2017 will see the release of not one, but two major updates to the operating system. Windows 10 Creators Update is due to arrive in the spring, and at Microsoft Ignite in Australia, the company confirmed that a second major update is on the way later in the year. We don’t know a great deal about this update, but it's likely to incorporate Project NEON design elements. While it is not a new revelation that a second big update is coming to Windows 10 in 2017, until now there has only been a passing reference to the second one from Microsoft. Speaking at Ignite, Microsoft's director of program management for Windows OS fundamentals and Insiders, Bill Karagounis addressed the audience about the Insider program, update releases and how Microsoft offers support for two releases at any given time. 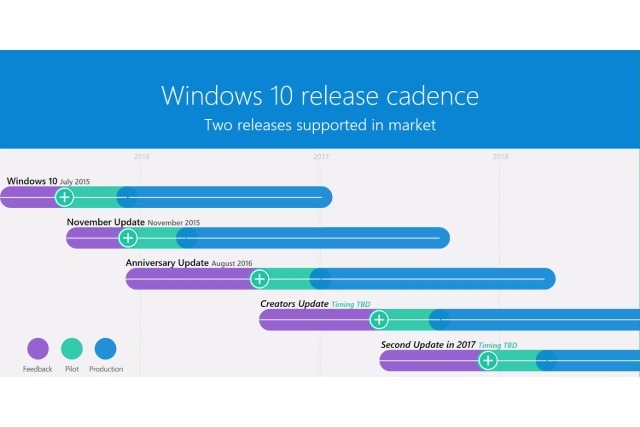 The timeline doesn’t include dates, but it does show that work on the second update should already be well under way, and public testing should start shortly after the release of Windows 10 Creators Update. You can watch the full Windows 10 event over on the Channel 9 website.